When I was a little girl, Mum used to joke that if you are what you eat, I must have been made of potatoes. Apparently, if there was a choice between any kind of food or even delicious treats and (mashed, steamed, fried, boiled) potato, I'd be all over the potatoes like a rash as if it were candy. Weird. I wonder if I had some rare elemental nutrient deficiency? Is it selenium that somes from spuds? Let me know! 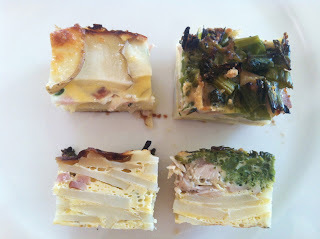 ...and my favourite recipe is potato frittata, which has taken many many forms in my topsy-turvy-many-housey lifetime. I can't believe I haven't blogged it yet for you! Potato frittata (or "potato based quiche") is a versatile dish. It is a great dish to cut up into little finger food/tapas sized pieces for people to nibble as an appetiser at parties and goes down well as it is substantial but snacky enough to bring to "bring a plate" functions or to work. It's also a lovely comfort food that you can serve up, country café-style on a plate with a simple salad. You can bake it, then keep it in the fridge as leftovers to eat cold or reheated for breakfast, lunch, dinner or supper; which is perfect for the times when I've been living the solitary shiftworker lifestyle and can only work up enough energy to cook once for a big round of days or nights on. I'm actually post-nights, and eating a big leftover slab of it right now as we speak. So here is the basic recipe, but if you can imagine it is three layers, one potato, one onion +/- bacon/ham; one potato, feel free to substitute in any cooked meat or vegies for the top two layers. --> Preheat the oven to 180degrees. --> Boil, steam or microwave these until al dente. These will be for both the base and top layers. As I do them in the microwave, I put half first into the microwave. While that is cooking I then sort out the middle layer (see below). Then while the second 500g (of potatoes or other vegies) is cooking I can start layering the first layer of cooked potatoes into the dish. If I have limited time on one day or know I plan to make frittata a day later, the other option is to cook all the potatoes, then allow them to cool and keep them in the fridge until you are ready for assembly. --> Fry these together in a pan with a spray or splash of olive oil until the onion is translucent and soft. --> Then layer on the middle layer mix; and again sprinkle on the seasonings. --> Then place the top layer ingredients (your 2nd 500g of potato slices, or whatever cooked meat/vegie mix you want to incorporate. If you have heaps of leftover vegies to use up or a cooked chook in the back of the fridge, you can skip the middle layer to allow more room for this stuff and to save time. Again sprinkly over a fine layer of the seasonings. --> Pour this mixture over your layered goodies. Allow to settle/gently encourage the ingredients down below the egg line with a fork. --> Bake for 45 minutes, or until the egg mix is set (which you can check by inserting a skewer in the middle which should come out cleanly if it is cooked through). I find most ovens are not 100% even, so I often pull it out at about 20 or 30 minutes to give it a gentle jiggle to check the firmness, then I rotate it around in the oven for more even baking. --> Allow to cool out of the oven once done to let the excess steam escape and the egg mix to firm up. I then use the baking paper and a couple of spatulas to lift the whole thing out of the pan onto a chopping board to allow for easier slicing. If you want to make small tapas sized pieces, use a very sharp knife and allow it to cool further before slicing to really firm up the mix (often I refrigerate it overnight then slice it the next day for this effect). For a standard sized round quiche dish, 3-4 potatoes are enough for each layer (see purple recipe above) and then alter the middle and top layers accordingly; use 6 eggs to 1/2 a cup of milk for your egg mix. For a larger roasting pan, use 11 or 12 eggs to one cup of milk, and larger potatoes or more meat/vegie mix. It's an art, not a science! Enjoy!!! Yum yum yum... looks so delicious my friend! Baha... as a child, my favourite foods were basically chicken, cheese, milk and potato. I still love them all but I've managed to balance out and include some vegies these days ;) Great instructions and photos. You = awesome kitchen wench.